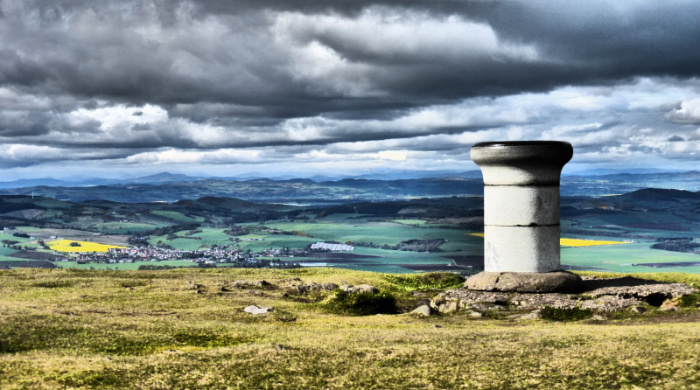 A visit to the smaller of the Lomond Hills’ principle summits but arguably this 424m vantage point has the bigger view of the two. There are certainly more strenuous ways of reaching the summit, but this one opts for a lofty starting point and a decent walk-in to warm up the legs before the final climb. Path Info: Good dirt/grassy paths but with a steep, rocky and often muddy final ascent. A very exposed summit. From the car park at Craigmead, cross over the road and head up the track with a green & yellow barrier across it. 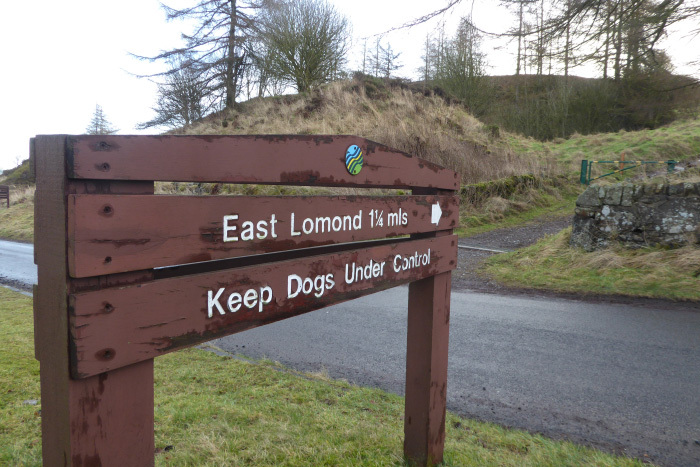 A sign points the way to ‘East Lomond 1 ¼ miles’. The first hundred metres or so are sure to dust any cobwebs off your joints, as the path climbs steeply from the road before bending to the left. But it soon levels out and after 5 or 10 minutes you find yourself on the Lomond Hills plateau, walking on a very straight path between two stone walls, across surprisingly flat ground. 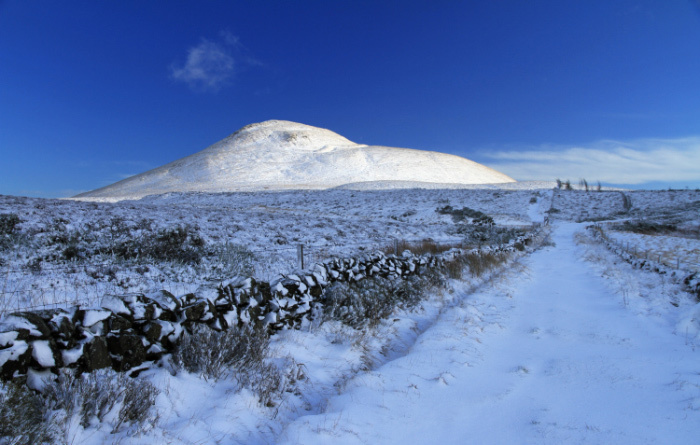 East Lomond looms up ahead. To your left the views north are huge, stretching across the Howe of Fife to Auchermuchty, and beyond into upland Perthshire and the Cairngorms. Follow the path all the way along the plateau until, just before the path bends sharply to the right, you come to a metal swing gate on your left. Go through the gate and turn sharply right, and then follow the dirt/grass path uphill. 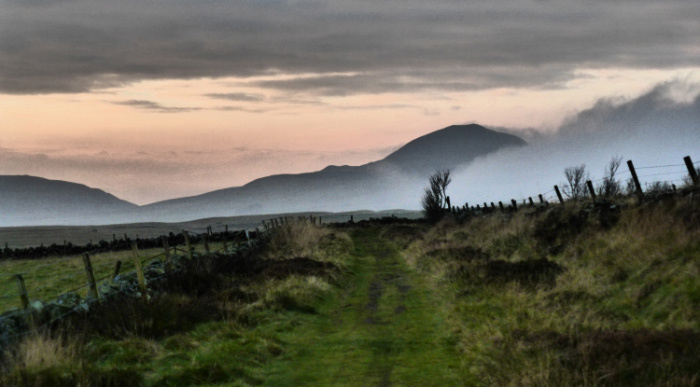 This path will now take you all the way to the top of East Lomond. Sheep graze these uplands for much of the year so keep your dog on a short lead or under close control, and pick up your dog poo. For the first ten minutes or so the path climbs gently across the moorland and grass, but before long you find the steepness increasing markedly as you start up the hill proper. Ignore the faint grassy paths that take the direct line straight up the hill and instead veer left along a well worn path that takes an easier route up the craggy slopes. This is the steepest part of the whole walk. The path is occasionally rocky and sometimes muddy so take your time. Eventually you emerge onto the summit ridge and the views north open up once more. Carry on up to the summit with its handy viewfinder that tells you what you can see on the horizon. Immediately below you can see Falkland, some 350m lower down than you. On a clear day the views north stretch all the way to Braeriach and Lochnagar in the Cairngorms. To the east you can see Dundee and along the Angus coast towards Arbroath. To the south you can see the Firth of Forth, the Bass Rock, Edinburgh, all three Forth bridges and, if you’re lucky all the way to St Abbs Head just a stone’s throw from the English border. Looking west, back the way you came, you can see West Lomond, Schiehallion and much of Perthshire. Don’t descend in the direction of Falkland. Instead head southeast in the direction of the obvious aerials / transmitters to meet the main path coming up the hill from the aerials car park. When you reach a fence, go through the metal gate and continue down the path, past the aerials and then into the car park. Turn right and walk to the far end of the car park, where you’ll see another green & yellow barrier across a path. Follow this mostly level path as it skirts around the edge of East Lomond. Sheep and cattle are sometimes in the adjacent fields so again, make sure your dog is on a short lead or under close control at all times. 1.5km on from the aerials car park you reach a sharp left bend above an old lime kiln, and find yourself back at the swinging metal gate (now on your right) that you went through earlier in order to gain access to the hill. If you have the time you might want to go through the metal gate on your left to do a quick loop of the historic lime kiln trail (20 mins), otherwise continue along the long straight path back to Craigmead. Fancy something even more challenging? 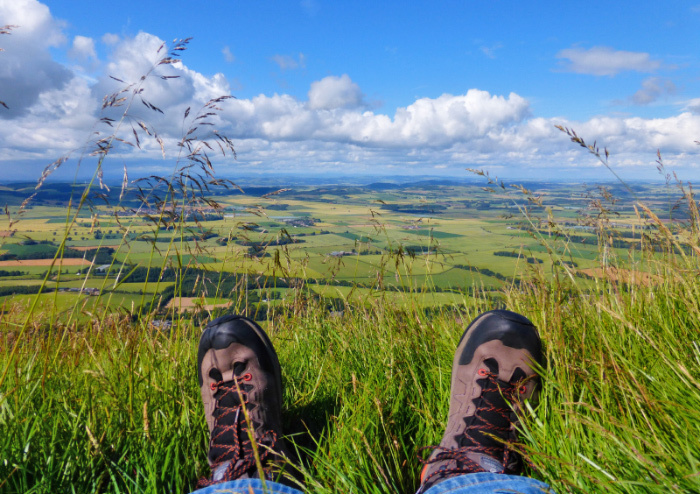 The Maspie Den and East Lomond walks can be easily combined to make a decent half-day’s walk. Starting at the Falkland Centre for Stewardship, follow the Maspie Den route as far as Yad waterfall. Then, when you walk behind the waterfall and climb out the other side of the den to meet the descent path, turn left instead of right. Instead of taking you back down to Falkland this takes you further uphill to the car park and toilet block at Craigmead, from where the East Lomond walk starts and finishes. It’s 1.3km from the waterfall to Craigmead. Once you have completed the East Lomond walk and have arrived back at Craigmead, simply retrace your route back down the Falkland path to the waterfall, and then pick up the Maspie Den route from where you left off.